One of the interesting things about vintage watches is they are relics of mortality. The most obvious association with mortality is vintage watches were made by people who have lived and died. In fact, their children's time on Earth may have also come and gone over the span of time a vintage watch has existed. I suppose you could liken every vintage watch to a piece of art and art can be appreciated for centuries after the age of the artist has passed. Another very unique and personal way vintage watches are relics is when you can find information about the original owner of the watch. That can be very easy - if you inherit it. I think most collectors I know originally had their interest piqued by inheriting a watch from their grandfather. I recently purchased a watch that was presented for 50 years of service in the 1950's. It's a 1957 Winfield and the model was produced for two years. 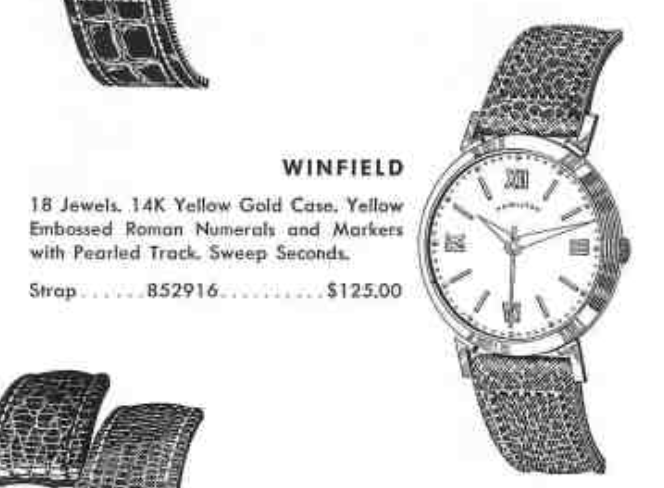 The Winfield was part of the Medalist line and a mid-grade model. It has a solid 14K gold case, which would place it at the high end of the mid-grade models but it also has an embossed dial, which I assume lowered it's price point. Other Medalist models had gold filled cases with sterling silver dials and applied solid gold markers or numerals. Tucked inside the case is an 18 jewel 8/0 size 735 movement, made in Lancaster PA.
My project watch arrived in good condition. There are a couple of marks on the dial and the case is obviously well-worn but it looks like a great candidate for a restoration. The back is engraved to Kelly J Bruce for 50 years of service to Katy Railroad. Interestingly the date is late 1955... so how did a 1957 model get a 1955 presentation? One explanation may be that the award was presented later in 1956 and the 1957 models were introduced in late 1956. The bezel pops off to give access to the dial and movement inside the case back. The movement can be lifted straight out of the back. The dial on this watch is a white finish with embossed golden roman numerals and markers. There's also a pearled minute track of gold dots. The outside perimeter of the dial is a little irregular, especially between 5 and 6. It doesn't look like a high quality dial, at least by Hamilton standards anyway. The 735 is a shock jeweled version of the earlier 748 movement. The inside of the case back is supported by a metal movement ring. There are a bunch of watchmaker's service marks inside so this watch has obviously been to a watchmaker numerous times. A new 30.3mm PHD crystal will be a nice enhancement for the watch. The movement is reassembled and ticking away with good motion. Things are looking good on the timer. I'll leave it running a little fast as it will likely slow down after it settles back in. I was able to clean the dial up a little and the watch turned out really well. Just polishing the case was a huge improvement but a new crystal and a fresh strap make a big difference too. Now you can see the engraving on the case back a little more clearly. A little googling revealed some information about the owner. Apparently he passed away just a year or so after this watch was presented and one week after he officially retired. It was obviously well worn and well taken care of so perhaps his son or grandson inherited it. Funeral services for Kelly J. Bruce, 74, Katy engineer, were held at St. Luke's Episcopal church Saturday, July 26, at 9 o'clock, with the Very Rev. David A. Jones officiating. Interment was in Cedarlawn Memorial Park with Johnson-Moore in charge. Mr. Bruce, a veteran of 53 years with the Katy railroad, died in the Katy employees' hospital Thursday, July 24, after an illness of two months. His home was at 130 E. Hull. He had been retired from the Katy one week. He was born in Wise county, Virginia, June 14, 1884, the son of Mr. and Mrs. W. B. Bruce. He attended school in Flat Gap, Tennessee, and was married July 31, 1911 in Denison to Adeline Calvert. He had left Tennessee at the age of 18, going first to Kansas where he worked on a ranch for a short time. He then went to Dallas and started work with the Katy, coming to Denison after one year there. He had lived in Denison 54 years. He was a member of St. Luke's church, the Eastern Star, Masonic Temple Shrine and the BofLE. Survivors are his widow; one son, County Commission Wayne Bruce; a sister, Mrs. Carrie Zinkle, Jefferson City, Tennessee; several nieces and nephews, two grandchildren and 2 great grandchildren.